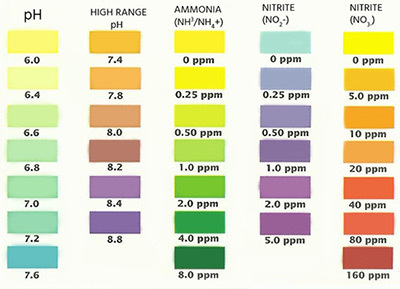 pH levels strongly affect how dangerous ammonia and nitrites can become in your aquarium. I will explain what pH is and then how to better understand how common toxins like ammonia and nitrite are affected by pH. What is pH (Power of Hydrogen)? pH [Power of Hydrogen] is a measure of how acidic or basic your water is. The pH is measured on a logarithmic scale that ranges from 0.0 (most acidic) to 14.0 (most basic). The neutral point is at 7.0 and you should strive to keep your tank water as close to this as you can. Most tropical fish are happy with a natural pH level. What Is being Measured When the pH Levels are Tested? When measuring the pH levels we are counting the amount of hydrogen (H+) and hydroxyl ions (OH-) present in the sample. Elevated levels of hydrogen ions (less bonded) – When there is an increases level of hydrogen ions the sample will be more acidic (less than 7.0). Reduced levels of hydrogen ions (more bonded) – When there is less hydrogen ions (H+) and more hydroxyl ions (OH-) present in the sample it will be more basic (greater than 7.0). Neutral levels of hydrogen and hydroxyl ions – When both hydrogen and hydrocyl ions are close to equal the sample will be neutral. A logarithmic scale measurement go up ten-fold. Aquarium owners tend to forget this and how important this is when modifying the pH levels in your fish tank. Example: A pH of 6.0 is ten times more acidic than a pH of 7.0. A pH of 5.0 is 100 times more acidic than a 7.0 pH level. When you understand this it will help you realize why it is best to keep your pH stable and within the desired range for your fish. When your pH levels are even just a little off it can have a huge effect on your fish and their health. A good rule to follow is to keep the pH level fluctuations to less than 0.2 within a 24 hour period. If you need to bring your pH levels down more than this you will need to do it slowly over time. How Does pH affect Ammonia Levels? There are two types of ammonia ions:Ammonia becomes increasingly more toxic in basic water, the reason goes back to the ions mentioned earlier. When you use an ammonia neutralizer this acts as a binding agent and turns dangerous ammonia into ammonium. How Does Ammonia Convert into Ammonium and Back Again? In acidic water ammonia ions (NH3) react with water to create ammonium ions (NH4+) and hydroxyl ions (OH-). In basic water the reaction goes the opposite way because, an abundance of hydroxyl ions is present in basic water. Instead of creating ammonium (NH4+) out of ammonia (NH3) and water (H2O) they hydroxyl ions (OH-) split from ammonium (NH4+) to create ammonia (NH3) and water (H2O). In basic water (pH higher then 7.0) makes it less harder for harmful ammonium to convert into dangerous ammonia. If you pH is basic you need to be more diligent regarding your water changes and water-testing. To avoid ammonia poisoning cycle your tank and always keep your ammonia level at 0. If you have acidic water don’t think you get off that easy. Ammonia is a serious killer and even at low levels it can cause irreversible damage or death to your fish. You need to be testing your water regularly, keeping up with water changes and keeping your ammonia levels at 0.